Yozora demands action this week! 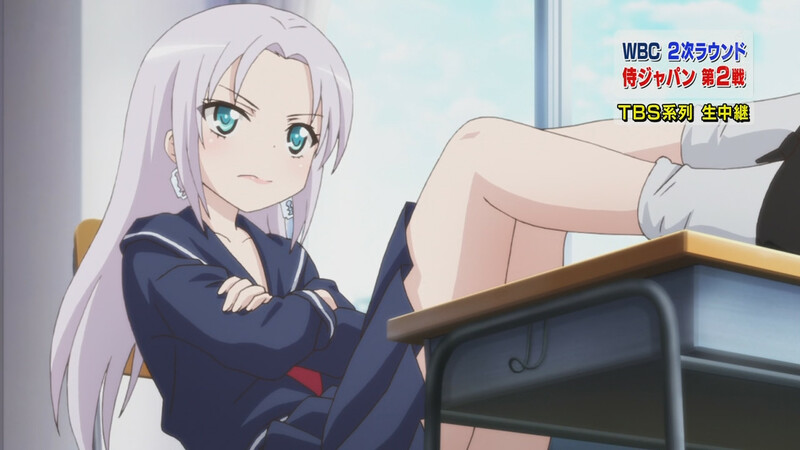 Welcome back readers we have reached the ninth episode of Haganai NEXT which brings us that much closer to the season finale of this series, but I look forward to seeing what happens this week since we left off with Yozora’s idea of making a movie for their club activity! So what about you Kara? How have you been? It’s been pretty damn cold over here, but otherwise, I’m doing well! The movie seems to be doing okay as well, even with the shocking (okay maybe not) twist at the end that the entire script has been plagiarized. On the other hand though, if Yozora rewrites it, maybe that’s when the OP’ nuns, witches and all of the other odd costumes come in? So last week the gears were starting to turn in Yozora’s head as she planned out a crazy script for their movie, but of course her original script because it caused so much trouble for the other club members and ultimately a tiny bit of drama between Yozora and Sena; however, with this episode we finally got to see the club begin filming their little movie. So, if you had to give an award best acting who would you give it to? I would say definitely not Yukimura! I would give it to Maria, but who knows maybe the final product will be fine for Yukimura with some cleaver editing. While the movie stuff was going on we got to see a brand new character introduced named Aoi Yusa? After her short introduction I kept thinking that this girl is the complete opposite of Sena in terms of personality, looks and book smarts! She was interesting, but it does seem a little strange that she suddenly appeared after she popped up in the opening. A New Childhood Friend Has Appeared! So Sena is engaged to Kodaka? …Well, I knew this since the first episode of the season thanks to comments, but they’ve been hinting at this all along too. Sena’s comments to her father haven’t really helped Pegasus either. It would work out well for her too considering that it would make Kobato her little sister for real and she obviously likes Kodaka.She’s hinted a lot that it would be nice if she could end up with Kodaka that way, but from the looks of things, but it’s not like she’s pushing the issue and saying that it HAS to happen because their fathers decided it. With the addition of yet another childhood friend, it makes me think even more about how Sena setting Yozora straight works in her benefit. The fiancé/other childhood friend was the one to tell Yozora that things in the past shouldn’t dictate all of your actions now. Maybe if Yozora wasn’t so attached to her own status of childhood friend, she could just brush off this announcement since Sena has been saying that things decided in the past by their parents don’t matter now. Kodaka isn’t repulsed to the idea, but it’s not like he’s for it either, so really, Yozora is just thinking too much about things here. coming to a movie theater near you in 2013! careful not to get burned Kodaka. Because she gets all the special captions! Come on Yozora! You can get over this! Not that I’m cheering for anyone in particular at the moment, but this season, it seems that Yozora just doesn’t seem to ever win. The last episode, that revelation with her clothing choices, the game she went though, everything she does just doesn’t seem to work. Sena is catching way more breaks than her by far. Though I was expecting Pegasus to push the issue of the marriage more, so I don’t think the Sena route is set in stone either. Anyways, on to the topic of the movie. …Yozora strike out again with the whole plagiarism thing (I’m waiting in anticipation to hear her explanation to this one xD), but the movie seems to be going pretty well so far. I think we can trust Rika with coming up with mind blowing CG and the acting is… well, pretty funny. There’s always something funny in having professional voice actors purposely pretend that they can’t act. I would have to disagree with that statement; it does not seem to me that the creators engineered the whole childhood scenario just to have Sena one up Yozora; as a matter of fact there was been quite a little build up, even in the first season that alluded to this possibility and cementing the fact the author had this planned the whole time. I always found it weird ever since watching the first season that the chairman and Kodaka’s father are supposed to be best friends for life and yet their children had never once met each other in the past???? that never made sense to me so the reveal that Kodaka and Sena have a childhood past actually fixes that illogical gap in the story given the fact that their parents are life-long friends. Yeah, I thought it was assumed that they’d met in the past. I mean, who could think that their fathers are that great friends and *never* introduced their kids to each other. This obsession with “I knew him first” in harem stories is getting out of hand. OreShura’s turned it up to 11 with not only the girl he’s known for 5 years, but the girl he knew 10 years ago in kindergarten, *and* the girl from his ‘previous life’. And of course, none of them get the idea that this is completely ludicrous. I’d definitely like to see a run of “osananajimi” losses that would break this silly trend, so we could go back to just having one, if that. yea it is getting out of hand so for once it is a breath of fresh air to have the female with said past connection (Sena) not see it as a big deal, especially since she didnt even remember it. Most characters would be throwing their weight around because of it. yea give now this sure meat & kodaka even met as kiddies only few solve harem ending for kodaka have both meat & yozora. (give we all know meat’s smell wig & pic yozora so foe yay in messed way). & poor yozora finding it out on all yea feel life got wasted for her. Yeah Yozora doesn’t have much on Sena anymore since both are in the running for childhood friend. I do hope Yozora can bounce back, cause she’s still my favorite character. I have to admit that Sena’s gotten a lot more likable lately, tho, with her quiet conversations with Kodaka. Those are really the times that she comes out best, unlike Yozora, who doesn’t shine in one-on-one conversations. I’ve been hoping to see that silly movie from the OP, rather than the ripoff movie that they’ve been making. But I do like Maria’s razor blade earrings and her trying to play the heavy. Pegusas is the Dude. And the Dude Abides. Seriously this character is one White Russian away from Jeff Bridges…. He was so high up after that jump that he might as well have been singing “I Believe I Can Fly”. That was a nice one. So all this talk about Kodaka and Sena dating actually has reasoning behind it because it was odd when Kodaka’s dad brought it up a couple of episodes back. At first, it seemed that conclusion was reached because of the time they currently spending with each other but the childhood friend went over my head and from the looks of it, Sena’s version has a stronger grip since it gone all the way back to kindergarten. At least Sena isn’t obsessed over it like Yozora who seems to need it just to prove her reason for living. In retrospect, if they were going along this, it should have been done earlier because this feels like a last minute rushed job decision. And LOL at Pegasus. The guy acts more like an immature kid than a chairman. The display he made running off was childishly humorous. Besides, who still carries out arranged marriage plans in this day and age? You would think Kodaaka’s dad would have been like, oh by the way son! You met Sena when you were a child…just thought i’d let you know, but NOOOO! That wouldn’t EVER happen. You would be amazed how much middle aged adults actually forget/cannot be arsed about…..
It’s getting mighty thick in Haganai land. At this point, I’m ready to say: To heck with them all, dude. Just go off and re-enact Yosuga no Sora. That would be one heck of a student film…. I’m sure Rika would go for any of those endings…. I didn’t imagine a thing. I just kinda left that there. But now I am. Thank you? It’s not a thing to be thankful about. I apologize. Really.